In July 2005 Rotarians embarked on their second century of Rotary service. Founded in February 23rd 1905 by Paul Harris in Chicago, Rotary is the largest humanitarian service organisation of business and professional men and women in the world with some 1.2 million members, operating in over 168 countries. The name 'Rotary' was derived from the early practice of rotating meetings among members' offices. In Great Britain and Ireland there are about 60,000 members in more than 1,840 clubs helping those in need and working towards world understanding and peace. In the last year more than £20 million was raised by Rotarians in the British Isles for charitable causes, as well as £6.5 million raised for the Asian Tsunami Appeal. In addition Rotarians' gave more than14 million man-hours of service, in support of community projects at a local, national and international level. The Rotary Foundation, Rotary's corporate charity, is dedicated to furthering international understanding, goodwill, and peace and gives more than £30 million every year to educational and humanitarian programmes. Rotary runs the biggest non-government scholarship scheme in the world. Rotary projects address critical issues in communities around the world in particular literacy and education programmes and water management projects. The President of Rotary in Great Britain and Ireland for 2005-2006, Mike Webb, has chose two particular areas to support. The international project was Mercy Ships bringing health care to those who have no access to medical treatment, and to assist disadvantaged communities through development projects. The completion of the latest ship to be added to the fleet, the Africa Mercy, will mean that an extra 450,000 people will be served every year. It is hoped that Rotary Clubs will equip the Ophthalmic Theatre by donations and also volunteer to work on the ships. The second project is Hearing Dogs for Deaf People to create awareness of how a hearing dog transforms a deaf person's life and to provide funds to sponsor hearing dogs. Most hearing dogs come from rescue shelters or are donated. A hearing dog changes a person's life on many levels. Providing practical support by alerting to everyday sounds, a hearing dog can restore a deaf owner's sense of security, independence and confidence because they no longer miss a phone call, or more importantly, miss a danger sound like a smoke alarm. All clubs are actively encouraged to support these causes. Membership of Rotary is by invitation, linked to a vocational category, and, generally, clubs meet weekly. Each Rotary Club operates autonomously within the Rotary family and selects causes it wishes to support each year. Community service is the traditional and well-known face of Rotary. It covers help and advice to the aged, the infirm, young people and all those in need, either directly or through local charitable organisations. In general Rotary encourages clubs to focus community projects on fighting hunger, environmental concerns, illiteracy, drug abuse prevention, childhood immunisation, and helping the young and the elderly. However each year the officers change and the new leaders have the discretion to identify causes they wish to support in their year of office. On the international scene Rotary sponsors a wide range of programmes such as: Preserve Planet Earth which focuses on critical ecological issues; Youth Exchange, an international exchange programme for school children; and the Rotary Volunteers programme which matches individual Rotarian volunteers with community projects world-wide. The Rotary Foundation provides humanitarian grants to improve the quality of life throughout the world. It supports international exchanges of students and teachers as well as business and professional people to further international understanding and friendly relations. The Ambassadorial Scholarships Programme is the world's largest privately funded international scholarships programme. Each year, nearly 1.000 university students receive Rotary scholarships to study in another country. Currently in Great Britain and Ireland there are 165 scholars at Universities, on scholarships totalling £2.25 million. One of the most successful projects supported by the Rotary Foundation, working with partners which include UNICEF, the United States Centres for Disease Control and Prevention, and governments around the world as well as the World Health Organisation, is the international Polio Eradication programme. In 1985, Rotary's members vowed to make the world polio-free. Rotarians in Great Britain and Ireland have raised more than £12 million for this project. Worldwide by the year 2005 Rotarians will have contributed more than £300 million. Today, there are only a few hundred polio cases worldwide, a 99% reduction since 1988, when polio paralysed more than 350,000 children a year. In an effort to educate tomorrow's peacemakers and ambassadors, Rotary has established Rotary Centres for International Studies at eight prestigious universities worldwide, including the University of Bradford. The programme provides master's level degree education in conflict resolution to a group of 70 Rotary World Peace Scholars chosen annually in a world-competitive selection process. 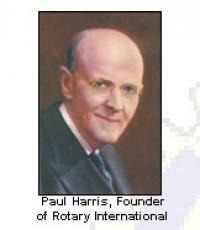 The Paul Harris Fellows programme was established in memory of the Founder to recognise substantial contributions to the Rotary Foundation's programmes. Notable Paul Harris Fellows include: HRH Prince Charles, HRH The Princess Royal; HRH the Duchess of Kent; Rt Hon Tony Blair MP, Luciano Pavarotti; Sir Anthony Hopkins; Sir Edward Heath MP; Baroness Thatcher; Baroness Chalker; Mary McAleese, Simon Weston, and Lord Rix.